Intervale bed and breakfast travel guide for romantic, historic and adventure b&b's. 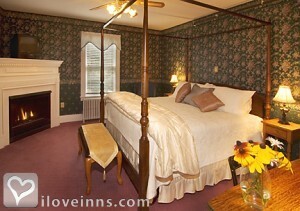 Browse through the iLoveInns.com database of Intervale, New Hampshire bed and breakfasts and country inns to find detailed listings that include room rates, special deals and area activities. You can click on the 'check rates and availability' button to contact the innkeeper. Intervale is a community in New Hampshire between two towns, Bartlett and Conway, which are also located in the scenic and rugged White Mountains. Intervale is one of the great skiing resorts in the Mount Washington Valley area. The Presidential Range offers great views. Aside from the skiing resorts and the breathtaking views of nature at its rugged best, one place that deserves visiting is the Hartmann Model Railroad and Toy Museum. It's two miles away from the center of Intervale. This museum provides an opportunity for both kids and adults to have a glimpse of the country's railroad system during its glory days. By Old Field House.